Just Romantic Suspense: Just back from the RWA conference! Just back from the RWA conference! Congratulations to "Bea" and "Erin", the winners in Mary's giveaway. Thank you to all who participated! Hi Just Romantic Suspense Readers! It’s me, Mary Behre. And I’m excited to be back on Just Romantic Suspense! I’ve recently returned from the Romance Writers of America conference and am really excited. First, Spirited and Guarded (Tidewater novels #1 and 2 respectively) were both nominated for the prestigious National Readers Choice Awards for Romantic Suspense. There was an awards brunch and my editor and agent were also invited. To my elated surprise, Guarded WON the award! You can’t tell from the picture of me with my editor (she’s on the left and I’m on the right), but I’m in five-inch platform heels. I was so thrilled to have won; I literally jumped up and down after they called my name. I’m still doing a happy dance. 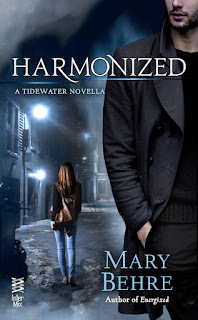 Second, my first novella, Harmonized, came out on July 21st. In that story old lovers reunite on Valentine’s Day to find a missing baby the world thinks is already dead. It’s a whirlwind adventure, suspense, and romance squeezed into a short book that’s big on hints of what’s to come in Energized. Finally, my latest full-length novel, Energized, releases August 4th! With a single touch of a metal object, Hannah can slip into another person’s memories. It’s fun until she stumbles into the mind of a serial killer. Her lover, Niall, knows she risks her sanity each time she uses her psychic gift but when his own brother is the killer’s next target Niall’s left with a deadly choice: Who to sacrifice, Hannah or his brother? To celebrate the release of both books, I’m doing a double giveaway! One person will receive an e-book copy of Harmonized and a signed copy of Energized. (Sorry, but USA residents only. Just Romantic Suspense will select the winner.) Who’s your all-time favorite villain? Answer that question for a chance to win. I’ll check back in over the next two days to share my favorite with you. Giveaway ends 11:59pm EST Aug. 4th. Please supply your email in the post. You may use spaces or full text for security. (ex. jsmith at gmail dot com) If you do not wish to supply your email, or have trouble posting, please email maureen@justromanticsuspense.com with a subject title of JRS GIVEAWAY to be entered in the current giveaway. US residents only. Ooh, good answer Joan. Both are on my list of all time creepiest villains. Sauron, I guess, is the one who comes to mind. Maggie Shayne had a female villain she redeemed in a novella later in the series but I don't remember which series/book/villain it was! LOL I just loved how she gave her such depth. Congratulations, Mary! A well-deserved award. I have a hard time reconciling the words "favorite" and "villain" but one of the villains I have the strongest visceral reaction to is Professor Umbridge from the Harry Potter novels. I am chilled by the way she rationalizes and justifies her actions; she really seems to believe she's acting for other people's good, when she's actually enjoying their pain and reveling in her power over others. It's the humanness of the evil that fills me with loathing. Someone like Voldemort or Sauron is superhuman in their evil; there's no humanity left in them, and for some reason, that's easier to keep at a distance - probably because it's not real. But an Umbridge is more like a Stalin or a Hitler - something possible, and therefore terrifying. Professor Umbridge is definitely one of the most evil villains I've read, for exactly the reasons you mentioned. She justifies and rationalizes her actions. Thanks for mentioning her, Lark! Congrats Mary!!!!! I'd have to also go with Darth Vadar. He was my first "villain" :) thanks for sharing! Thanks for stopping by. I found Darth all the more terrifying the moment he revealed he was Luke's father because wow...he knowingly set out to destroy Luke. Still makes me shiver. Congrats on your win! Fav villain... I will say no one specific... just a villain that really keeps the characters on their toes and keeps me guessing till the end. No favorite villain. One that comes to mind is Mrs. Danvers from Daphne du Maurier's REBECCA. Ooh! Mrs. Danvers was a most excellent villain. Thanks for mentioning her. Hmm, a favorite villain. Well some top villains are Malcolm from Women of the Otherworld, Darth Vader from Star Wars, Snape and Professor Umbridge from Harry Potter but no one stands out as a favorite.